Believe it or not, the economy seems to be on its way back up. That means people are buying more things that need to be shipped here and there. The U.S. Bureau of Labor Statistics projects that it will mean a 20 percent growth in the demand for truckers over the next eight years. But there's a problem. Even though there are nearly 200,000 open positions, not enough people are stepping up to the plate to become long haul truckers. The reasons why are simple, and the first is practical. Getting certified to drive a big rig is a lengthy process, and expensive. A licensing course can take eight weeks, costing a potential driver about $6,000. 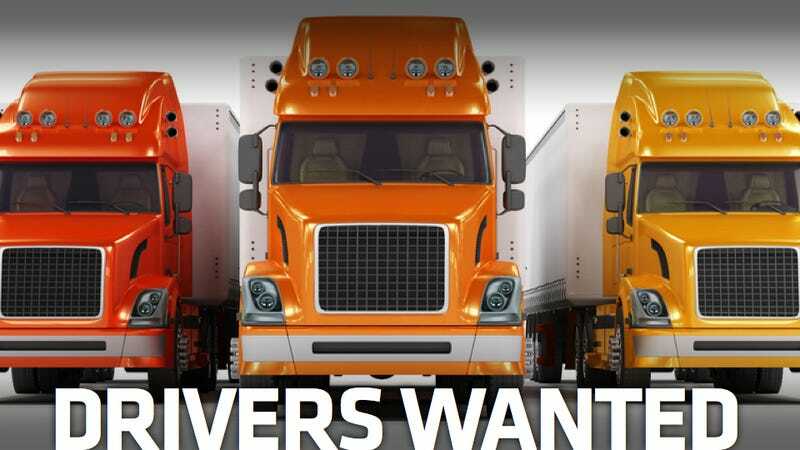 Truckers make decent money — CNN Money reported that they make a median wage of about $38,000 per year, or $4,000 higher than the national average — but it can be difficult for someone who's unemployed to cough up the cash for school. Then, of course, there's the long-haul lifestyle, which isn't all that appealing to many people. Most truckers spend weeks at time on the road, living in tiny quarters in the back of their rigs. To make matters worse, trucking companies often encourage drivers to work in pairs to increase range and efficiency, a setup that sounds to me like trucking's version of U.S. Navy hot bunking. Not to mention, working as a trucker ain't exactly as cool anymore as it was in the days of White Line Fever. And although trucking companies try to hire veterans who can use G.I. Bill benefits to pay for training, they also have to be careful that the people they're hiring as drivers are reliable and safe. This can be a challenge, and as the FBI has seen in recent years, the strange, lonely world of trucking can be a petrie dish for violent crime. It will be interesting to see how the trucking industry addresses this problem over the coming years. Goods still need to flow from place to place as business continues to grow. Perhaps we'll see more renegade truckers out on the road. Anyone need a job?